Caringo (www.caringo.com), one the pioneer and leader of the object storage wave, founded in 2005, introduced recently a pretty interesting piece of software named FileFly. 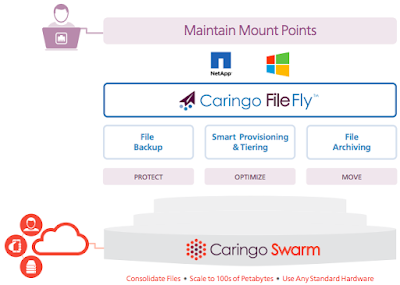 In a world where we speak everyday about scalability with scale-out storage approach, it's clever from Caringo to release a product that targets scale-up file storage. This is an obvious consideration but many vendors forget the strong presence of classic file servers in the enterprise without any desire to swap out the current good solution. At the same time, companies accumulate a lot of data, many of them are perfect candidates for an intelligent approach to multi-level storage or storage hierarchy. In 2 words FileFly is a data migration software that selects file candidates from a primary file server, move them intelligently to Caringo Swarm and maintain access to data on the original residence. In that method, it looks pretty similar to an HSM product who has the property to be fully hidden to applications and users meaning that the secondary storage is totally ignored. When a migrated file is accessed, there is a small information (stub file) let on the original residence with enough information to redirect the IO operations to the new residence of data. The read operation when data is migrated is a bit delayed to allow the cache back mechanism to take place and then release the read operation on the primary storage. Caringo FileFly supports today Windows server and NetApp, and requires the Windows server and any configuration: Windows server only or Windows and NetApp filers. 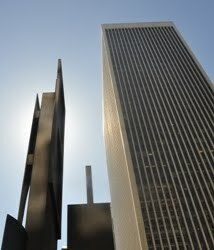 For NetApp and its close world, the product relies on fpolicy to find out and operate all file operations without any installed piece of software. This is clearly a smart addition to the current offering - Swarm - that contributes to the adoption, limits the entry barrier and simplifies deployment, installation and potential questions about integration between independent layers. It also serves as an investment protection for enterprises that just add a intelligent data layer and data storage platform to their environment, and contributes to reduce the primary storage TCO. We'll see how competition will react but for now, no other players in the top 5 object storage vendors have similar approach.